WHAT DOES THE PIGMENTATION TREATMENT ENTAIL? The pigmentation treatment involves chemical peels with 20%-50% salicylic acid concentrations, or trichloroacetic acid (TCA). The chemical solution is applied to the skin to help gain a smoother skin and even out the complexion by reducing areas of darker pigment spots. 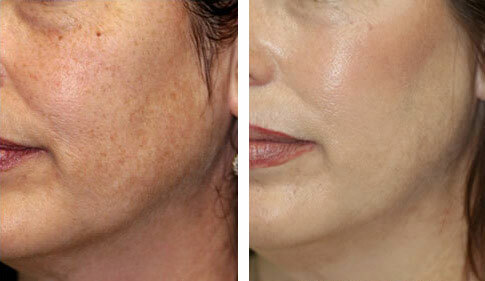 The chemical peel also reduces the appearance of acne and makes fine lines and wrinkles less visible. The chemical peel removes several layers of sun damaged skin cells, revealing a fresher skin with a more even surface colour. The peel also stimulates the formation of new collagen, which helps improve skin texture as well. A Salicylic acid is used for a superficial depth peel. This is ideal to treat uneven pigmentation and acne. The TCA peel is a medium depth peel. It is mainly used to treat fine surface wrinkles, superficial blemishes and blotchy pigmentation. It may take up to one week for the renewal and rebuilding process to allow your skin to return to normal and see results. Light peeling of the skin is expected but not necessary to see the improvements you want. There may be some crusting, especially after a TCA peel – this should be allowed to heal naturally. For optimal results, a course of 4 salicylic acid peels is recommended at monthly intervals or two TCA peels at six monthly intervals. The entire pigmentation treatment only takes 25 minutes. The treatment must be administered by our specially trained doctor or skin care therapist. You can return to your normal activities immediately after a salicylic acid peel. However, following a TCA peel the downtime period is at least 48 hours. The treatment may cause an acne flare due to deep pore cleansing. Some patients may experience temporary spots of hyper- or hypo-pigmentation, which usually resolves itself. Chemical peels are recommended to patients with open pores, dull, tired skin, where there is a loss of glow. Our highly skilled doctor will advise on the appropriate peel. It will range from R800-R1200 per peel. The total cost depends on the number of sessions needed to achieve the desired results. Prior to your first session, you will receive a treatment plan that outlines the anticipated cost. HOW CAN I MAINTAIN BLEMISH FREE SKIN?